There are several mistakes that I consistently see new (and even experienced) real estate investors make when first venturing into house flipping. 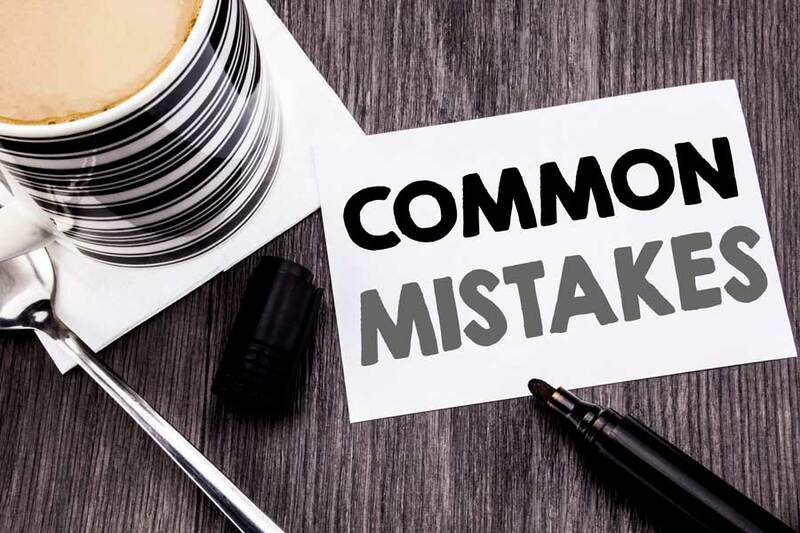 These mistakes are understandable when the excitement to get started conflicts with the knowledge required to execute a house flipping project quickly, cheaply, and profitably. In this article I list the seven major house flipping mistakes that new real estate investors are likely to make when first starting, and how to avoid them in the first place. When a new investor wants to start flipping, they turn to the first place they know to find properties: the market. These are properties listed by agents on the MLS at market prices. Frustrated with a lack of inventory and significant competition for on-market properties, new flippers will often just end up buying anything, in the hopes that the numbers will work themselves out because the market is hot and going up. That is a recipe for disaster, because as an investor, you will need to acquire properties at much less than seventy cents on the dollar for a deal to make sense once all of the costs are factored in, and not just rehab costs, but holding costs as well. Although there are some ways to make a profit with market-priced properties, new investors often don’t know how to structure a deal in a way that will work in their favor. So how can you buy low? To get properties at less than seventy cents on the dollar requires finding properties off-market. Your typical new investor will not have developed access to, or systems in place, to find off-market properties, such as relationships with wholesale property marketers, or performing their own off-market lead generation. The easiest properties to buy are the ones in the worst shape and as a result are priced at the lowest prices. Unfortunately, those are also the properties that need the most work, and require the highest level of experience to execute successfully. Simply due to not having estimation strategies or a solid understanding of the many components of a rehab, new investors may be unable to estimate the level of rehab necessary to improve these properties. As a result, they cannot estimate the rehab costs accurately. The inability to foresee and plan for as many rehab costs as possible has a cascading effect of drastically changing the completion timeline of the flip, which again has devastating effects on the project budget. Finally, these (typically gut) rehabs come with extremely high project risks. New house flippers often do not have the knowledge and strategies to mitigate those risks before they happen, and will instead continually be in a position of having to perform damage control which invariably costs time, or money, and most likely both. Bottom line: just because a property is priced low, does not mean you are getting a bargain. How can you avoid expensive flip projects? First, realize that the cheaper the property on the front end, the more expensive it will be on the back end, whether via the pure rehab costs, or through the increased time, and risk exposure. I then take that back to the office and re-watch the video over and over to make sure that all of the estimate items are accounted for. After entering all of the basic rehab numbers, if I still have what looks like a deal, I then spend the time and use the REIkit.com rehab estimation tool to create a very detailed itemized list of all of the construction costs for the project. I use that estimate to get itemized bids and negotiate pricing with contractors. House flipping comes with many risks that are often glossed over by popular house flipping shows on TV. So, if your only exposure to these risks is the over-simplified profit summary you view at show’s end, then you are completely unprepared to mitigate those risks. We were all new investors once, and new investors are guaranteed to pay for a lack of knowledge with either time or money — or both. When this reality is combined with purchasing the cheapest and most difficult project as mentioned above, the losses from those risks very often become insurmountable. How can you avoid losing time or money on a house flip? Never underestimate how much you don’t know. A much wiser approach when learning how to flip a house is to start with a small, less profitable flip, in order to learn the ropes, learn the process, and build a trusted team of contractors and realtors to help you take bigger risks in the future. You will make many mistakes, but continually learning and evolving your house flipping process is key to making sure each flip leads to another one. When you have a team of trusted individuals helping throughout a flip, you are able to take advantage of favorable pricing from them, in exchange for your return business. This team includes contractors as well as realtors. If you do not have that team in place, and your contractor treats you like a retail home improvement customer, you are going to pay significant premiums to their cost. You have to find a contractor that will work as cheaply as possible without sacrificing quality, and negotiate pricing. Similarly, if you pick just any realtor and don’t negotiate pricing, you will pay too much for your flipped home sale. How can you avoid paying too much for contractors? When looking for contractors to join your team, you can start with major retail home improvement sites such as Angie’s List or HomeAdvisor, but make sure to ask if they are investor-friendly. This should weed out the ones that have decided to only work with retail consumers. On those sites, that will be most of them. Along with that, try your local real estate investment clubs and ask other investors for recommendations for a flip friendly contractor, although keep in mind that many won’t share this information. My favorite way is to stop by houses that are being rehabbed and ask for the contractor’s card. For the businesses that remain in the running, when you get a bid based on the Scope of Work that you created — using the itemized list of items that I talked about earlier — you then have to make sure that they provide you with an itemized bid. Most contractors that deal with retail customers hate to do this and will only provide a very general breakdown of costs. Remove those who refuse to submit a detailed bid to narrow your list down further. Working with investor-friendly contractors is one of the most important ways to save money on a flip. They understand that a house to be flipped requires shaving off every dollar possible on materials. So, for example while a consumer might choose a custom and unique paint scheme for their interior, an investor-friendly contractor will mix together similar neutral paints, both to save money on paint and to ensure that the house appeals to the largest number of people. Although many contractors do use the big box stores for materials, there are also tricks of the trade for saving money on materials. This includes going direct to a local distributor or lumberyard for volume discounts, purchasing clearance items, and buying in bulk. How can you avoid paying too much for flip construction materials? Don’t get attached to materials or finishes. You’re not going to live in the property. As you begin to build relationships with distributors and use other methods mentioned while acquiring items, you may be able to phase out purchasing materials from your contractors altogether and just contract them for labor. This will allow you to control and systematize the rehab process, as well as avoid a potential price mark-up on materials added by your contractors. With HGTV partly to blame, for many people the most fun part of the project is turning something ugly into something beautiful, and this inevitably ends up being an over-improvement to what is currently available on the market. However, a homeowner flipping a house for his or her own enjoyment behaves in a way vastly different to an investor who is running a house flipping business. The point of flipping house is to create a product that enough people want at the best cost. There is always going to be tension between what the market demands and what can be profitably delivered, but many new flippers don’t have the ability to gauge the level of improvement necessary to succeed. How can you avoid over-improving a flip property? Knowing how to find accurate comps is absolutely imperative. By finding comps in the same neighborhood that were remodeled, you’ll be able to view the interior on Redfin or Zillow and gauge the level of improvement necessary to get your flip up to homebuyer expectations. To avoid over-improvement, also view non-finished houses to determine if some improvements can be adjusted if they are present in all properties. For example, if there is only one remodeled house in an area, and it has marble floors in the bathroom, but all non-improved properties have square white tile, it may be enough of an upgrade to simply use a rectangular colored ceramic tile in your flip. Stop by open houses of properties. You are bound to see one or two that have been flipped. Pay careful attention to the difference in finishes between consumer flipped and investor flipped properties. By biting off more than they can accomplish, not having a team in place or using the wrong team, not knowing the construction management process, over-improving, and not mitigating risks, the flip managed by a new investor usually ends up taking significantly longer than anticipated. This increase in holding time can have giant negative financial consequences when the flip is financed with Hard Money, as you are being charged thousands of dollars for every day that the flip goes over the completion end date. How can you avoid a house flip taking too long? Understand all of the costs associated to a flip so that it becomes obvious when a hot deal is actually a pass. This will get easier with each flip you analyze. Build your team carefully, checking history, references, licenses, and a history of previous lawsuits. Have a construction timeline and make sure you continually monitor contractor progress. Additionally, have contracts in place that reward early completion and punish time overruns. Be aware of all of the risks inherent to flipping houses that I have gone over, and make sure you have a Plan B in place if one aspect starts to take too long, or cost too much. New house flipping investors eager for their first deal often jump into one without considering all of the negative factors that are inherent to a house flip, and there are many. Hopefully, I have provided you with some awareness of these most common house flipping mistakes, so that you can try to mitigate them before committing to your first project, and make that flip the most profitable it can be.